The ancient kingdom of Goguryeo is a source of an immense national pride for Koreans, as it once single-handedly fought off the most powerful Chinese empires. But it is also a kingdom in which period dramas are rarely set, due to a lack of knowledge and research about it. The upcoming film “The Great Battle,” directed by Kim Kwang-sik, is one that follows the desperate 88-day fight between 200,000 soldiers of the invading Tang Empire and 5,000 Goguryeo soldiers led by Gen. Yang Man-chun. “Most of the period pieces in Korea are based in the era of Joseon Dynasty. This (film) attracted me in that it deals with the history of Goguryeo, which myself had forgotten about. Of course, I personally was fascinated with Gen. Yang myself,” said Zo In -sung, playing the lead role Yang. Yang, who commanded the forces at the fortress of Ansiseong, is thought to be a man of integrity as he refused to fall in line with Yeon Gaesomun after he took control of the country in a military coup. After unsuccessful attempts to take the fortress, Yeon allowed Yang to retain his position as commander. Despite being a compelling figure, hardly any record of him exists outside of his fight against the Tang army. This allowed leeway for the actor and director to reimagine Yang. “Rather than the authoritative image created by generals in other period pieces. ... He (Yang) is revered (by the public) but doesn’t care for it. He serves the people from the lowest position,” said Zo. “Why would Yang want to defend Ansiseong, even as he is being called a traitor (by Yeon)? I gave it a lot of thought, and the answer is that he would not have wanted to lose the people there, or their happiness. That would’ve led him to defend Goguryeo. The siege of Ansiseong was near the dusk of Goguryeo Kingdom, when its territory was limited to the area that is now occupied mostly by North Korea. This means the records for the battle itself are mostly inaccessible here. Kim imagined the system and the chain of command at the fortress on the basis that the ruler of the time did not have absolute control over his subjects, which would mean the place would have a relatively high level of autonomy about how things are run. “Out of nearly all the battles in Korean history, it is the only one a depiction of which would exclusively focus on the siege of the fortress itself. I wanted to put on screen the sight of fighting over a fortress,” said Kim. 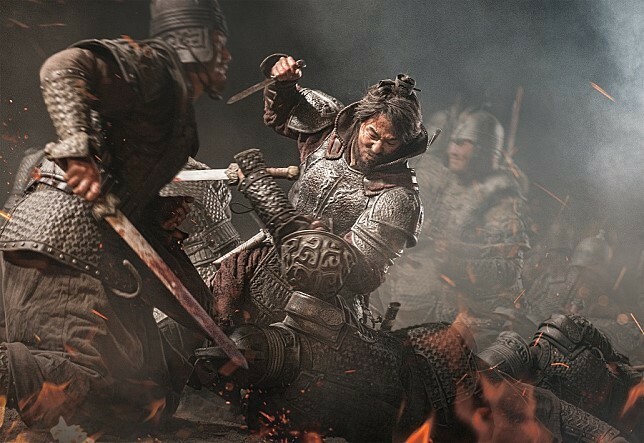 In order to relive the battle, director casted young actors that could do action sequences, resulting in the characters shedding the authoritative aura that is often depicted in Korean period pieces. Park Sung-woong, who plays the Chinese Emperor Taizong, is a veteran actor expected to bring balance and sense of urgency with his acting prowess. Another cast member that stand out is the budding starlet Kim Seol-hyeon, who is better known to the public as K-pop star Seolhyeon of AOA. She plays the fictional character of Baek-ha, Yang’s sister and the leader of an all-female troop of the same name. “Baek-ha is the leader of the all-female troop, and I liked the character because I understood exactly what it was that she wanted to do,” Kim said. “Goguryeo is thought of as aggressive and not backing down from a fight. I imagined that the women there would not have been passive in an invasion,” said director Kim. “The Great Battle” opens in local theaters on Sept. 19.